Veterans Monument, Portland Square, ca. 1910, from the Toronto Public Library (PC 3015). More than 100 years later, that is still the case. In his speech, Merritt said that centennial commemorations of the war were being organized, and that it was “no secret” that Ontario’s premier, Sir James Pliny Whitney, “was in sympathy with the idea of erecting a suitable monument.” Shortly after, Toronto’s Army and Navy Veterans Association wrote to the Globe to remind Merritt and Torontonians that the city already had a memorial to those who had fought in the War of 1812. It had little effect. Merritt would continue to campaign for a monument at Queen’s Park doggedly. 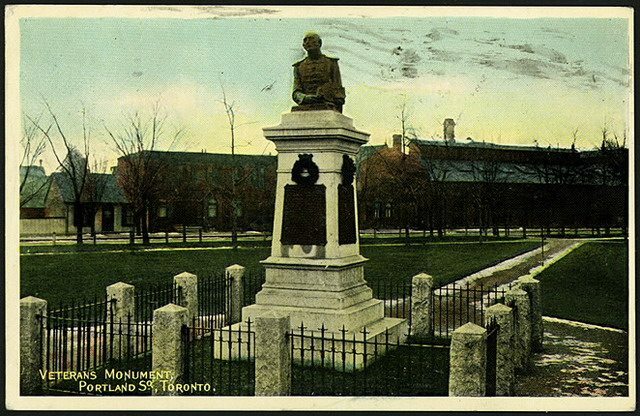 The monument to which the letter-writers referred was Walter Allward’s sculpture of the “Old Soldier,” unveiled in January 1907 at the centre of Toronto’s old military burial ground (now called Victoria Memorial Square). Bronze plaques affixed to each of the pedestal’s four sides honoured those who gave their lives in the War of 1812; the monument also honoured the British soldiers who had died while stationed in Upper Canada and were buried at that location. Had Merritt listened, that letter might have spared him some harsh lessons, learned in the course of a years’ long campaign. The Victoria Square monument had cost just $4,000, but it had taken five years to complete partly because of delays in fundraising. (Some $200 remained outstanding when it was unveiled in 1907.) And Merritt’s ambitions were much greater. Another organization, The Memorial to the Heroes of 1812-14 Association, arranged a January 1911 meeting at the Queen’s Park legislature for the premier, leading citizens of Ontario, representatives of numerous historical associations, and delegates from the Six Nations. Premier Whitney promised that his government would give the matter full consideration; his encouragement spurred the memorial association to gather signed petitions and to lobby elected officials at all levels of government for public funding. In two months, Merritt would learn that “full consideration” by Whitney and his Conservative government did not mean financial support. Providing the premier with a range of estimates, ranging from $20,000 for a small memorial to $100,000 for the much larger monument he hoped for, Merritt inquired if the provincial government might budget $10,000 to help move the project forward. Whitney’s response: it was “simply out of the question…to put a single dollar in the Estimates for that purpose this Session… It is a great mistake to imagine that this Government intends to take on its shoulders the burden of this monument. It intends simply to assist.” The premier recommended that the memorial association continue working at its own fundraising. With no financial support from the provincial government forthcoming, Merritt travelled to Ottawa in February 1912 to seek financial support from federal officials. By the time he arrived, the project had grown in scope: Merritt described the project as a $200,000 campaign for a memorial arch—double the estimate he had given Whitney. Like the premier, Prime Minister Robert Borden provided no funding, but promised that he and his government would give serious consideration to Merritt’s request. 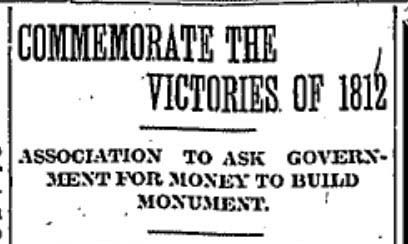 The memorial association remained confident in its ambitions, and several months after this editorial exchange it renewed its campaign at a meeting on June 12, 1912. That gathering brought together representatives from Toronto’s genteel associations, including the United Empire Loyalists’ Association, the Daughters of the Empire, the Canadian Club, the Canadian Institute, the Board of Trade, and the Canadian Military Institute. 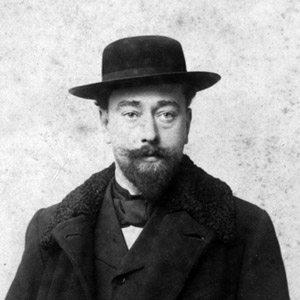 It also featured a special guest: the Parisian sculptor Paul Chevré, who presented some design suggestions for the monument. The association had extended a special invitation to Chevré, knowing that he was coming to Ottawa in the spring for the unveiling of his bust of former Canadian prime minister Wilfrid Laurier at the Chateau Laurier Hotel. (This was just one of several sculptures that Chevré had created for Canadians; the most notable was an acclaimed statue of Samuel de Champlain erected on Quebec City’s Dufferin Terrace.) It was remarkable that Chevré had arrived in Canada at all, for he had made his transatlantic crossing on the Titanic. Chevré survived the ocean liner’s sinking, but his designs and estimates for Toronto’s War of 1812 monument were lost. All he could present to those who had gathered was a recreation of his ideas assembled upon his arrival to Canada. Headline from the Toronto Globe (June 13, 1912). It would prove to be an overstatement. After hearing from Chevré, the memorial association decided it would begin to select the monument’s design, tender contracts, and continue fundraising. It was this last task that would prove the greatest obstacle. It’s not known how much money the association had raised as of June 1912, but the Globe suggested that they would need to raise some $50,000-$100,000, with the Canadian government likely providing the rest. Federal funding did not materialize, however, and the prospects for a monument at Queen’s Park dimmed over the course of that summer. Efforts to raise money from the public also faltered, perhaps due to donor fatigue (there had been recent fundraising drives for both the Victoria Square and South African War memorials). Even Merritt’s choice of Queen’s Park was questioned: some thought a location near the University Avenue Armouries would be best; others preferred Exhibition Place. Merritt did not give up hope of producing some type of memorial to the heroes of the War of 1812, but the shape of the project had to change. 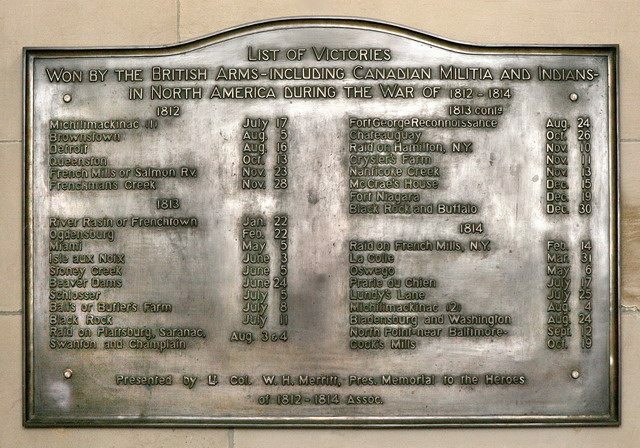 In September 1913 he contacted Prime Minister Borden with a significantly revised proposal, this time for a bronze tablet inscribed with a chronological listing of thirty-four British victories from the war. Merritt hoped that Borden would have the plaque installed in the Parliament Buildings in Ottawa. After conferring with members of his cabinet, Borden approved. Cast at a German foundry, Merritt shipped the tablet to Canada in early 1914, and it was installed in the Centre Block that spring. War of 1812-1814 bronze tablet, courtesy of the House of Commons Collection, Ottawa. Though the tablet was certainly not as large as a Queen’s Park monument would have been, it was a memorial in the halls of the Canadian parliament. The national prominence of this location was likely an acceptable trade-off to Merritt, considering the financial realities that limited the original plans. A devastating February 1916 fire destroyed almost all of Canada’s parliament buildings; only the parliamentary library survived. Remarkably, the War of 1812 tablet did also. In the early 1920s it was reinstalled in the rebuilt Centre Block, between the Reading Room and the Library of Parliament, where it can still be seen today. Ross Fair is a member of Ryerson University’s Department of History, where he teaches a course on Toronto’s history. He recently curated a War of 1812 exhibit for the Archives of Ontario, Perceptions of 1812: Identity, Diversity, Memory, which is open to the public at the Archives’ Helen McClung Exhibit Area until December 2014. He will present a lecture at the Archives of Ontario on March 21, 2013. Sources consulted: Archives of Ontario, James P. Whitney Papers F5; Women’s Canadian Historical Society Papers, MU 7839; Library and Archives of Canada, “Placing on Wall of Parliament Building of Bronze Tablet Recording Victories of British Arms in North America 1812-14,” RG25, Series A-3-a, Vol. 1136, file 1362; Boston Evening Transcript, June 30, 1909; Toronto Mail and Empire, June 22, 1910; January 20, 1911; June 13, 1912; Toronto Globe, January 2, 1902; January 7, 1907; May 25, 1909; June 22, 1909; June 22, 1910; May 1, 1911; February 5 and 6, 1912; June 1 and 13, 1912; Toronto Daily Star, December 17, 1910; January 20, 1911; February 2, 13, 16, and 23, 1912; Toronto Telegram, December 17, 1910; Carl Berger, The Sense of Power: Studies in the Ideas of Canadian Imperialism 1867-1914 (University of Toronto Press, 1970); Trent University Archives, Gilbert and Stuart Bagnani fonds, 94-016; “William Hamilton Merritt,” Dictionary of Canadian Biography, Lisa Dillon, “A History of the Old Military Burial Ground“; Deirdre Follett and David Monaghan, “War of 1812-1814 Plaque,” The House of Commons Heritage Collection.